Remains of a burnt out home in Bor, South Sudan. (file). United Nations panel on human rights violations in South Sudan documents unspeakable cruelty against civilians, not just limited to widescale brutal massacres and sexual violence but extending to individuals trying to defend themselves or their families and had their eyes gouged out, their throats slit or were castrated. 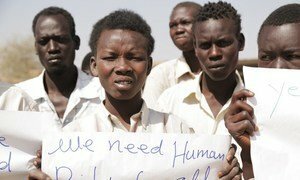 A United Nations inquiry into allegations of human rights violations and abuses committed during the ongoing conflict in South Sudan has concluded that some of the violations may amount to crimes against humanity and war crimes. Since conflict erupted in the world’s youngest nation in 2013, over four million people have been driven from their homes. “Holding those in charge in South Sudan accountable for the intentional suffering they inflict on their own people is crucial to stemming this humanitarian catastrophe,” Andrew Clapham a member of Commission on Human Rights in South Sudan, said on Friday. The Commission, established by the Human Rights Council in March 2016, has identified more than forty senior military officials who may bear individual responsibility for war crimes and crimes against humanity in the country. In addition to investigating allegations, the Commission is also mandated to collect and preserve evidence for use in the Hybrid Court and other accountability mechanisms agreed under the 2015 peace agreement. The public report, which reflects only a portion of the information in the 58,000 documents and 230 witness statements collected, documents abhorrent instances of cruelty against civilians, including massacres, sexual violence as well as destruction of homes, hospitals and schools. People who tried to defend themselves or their families had their eyes gouged out, their throats slit or were castrated. It also noted that children have been recruited by all sides in the conflict and forced to kill civilians; in many cases they have watched loved ones raped or killed. The elderly have not been spared either. Unable to flee on foot they have been left behind in villages only to be hacked to death or burned alive, it adds. The report is to be discussed by the Human Rights Council – the highest UN intergovernmental body on all matters related to human rights – next month. Undue restrictions on freedom of expression are having a “chilling effect” and “further shrinking the space for debate and dissent” in war-torn South Sudan, a new United Nations human rights report has revealed.